Speaking at the plenary session of the third meeting of the Speakers of the Eurasian Countries’ Parliaments in Antalya, the Vice-President of the Armenian National Assembly (Parliament) Eduard Sharmazanov, in accordance with the traditions of the aggressor state, has voiced illogical, false thoughts of slanderous nature about the far-fetched "Armenian genocide" and the Nagorno-Karabakh problem. The Chairman of the Azerbaijani Parliament Ogtay Asadov has given a weighty response to Sharmazanov's comments, the Azerbaijani Parliament’s Office said in a statement. "The thoughts expressed by the representative of Armenia in order to mislead this authoritative event forced me to speak again. In fact, our today’s meeting is held to promote peace, dialogue and development in the region. As you know, the people of Nagorno-Karabakh do not exist. 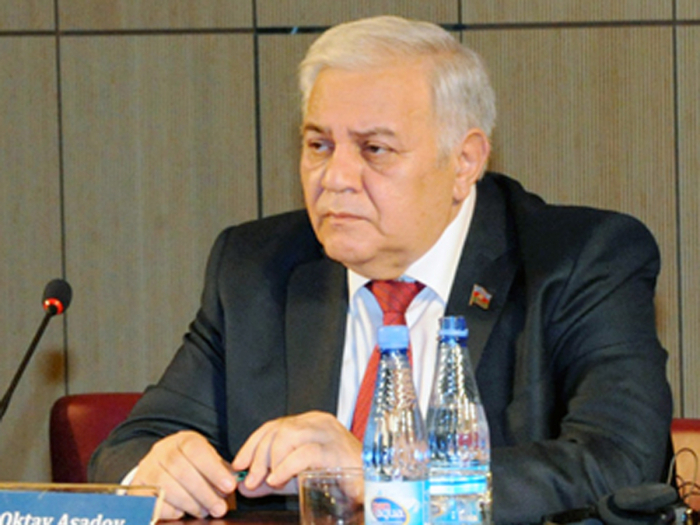 Azerbaijani and Armenian communities lived in Nagorno-Karabakh," Asadov said. "As it is known, as a result of ethnic cleansing, Azerbaijani population of Nagorno-Karabakh was expelled from their native lands. The idea of ​​the Armenian representative about granting the right to self-determination to the Armenians currently living in Karabakh is completely erroneous and contradicts the laws. Now, an interesting idea arises: does it mean that if Armenians live somewhere compactly, then should they be given the right to self-determination?," asked Asadov. "The fact that the representative of Armenia did not mention Turkey in his speech, where the meeting is held, testifies to the level of his culture. Armenia, who constantly accuses Turkey of committing a fictitious "Armenian genocide", itself committed genocide in the Azerbaijani city of Khojaly. Many countries, including 18 states of the US, have adopted resolutions in connection with the Khojaly genocide. In particular, I want to note that international organizations, the UN, the European Union, the European Parliament recognize Armenia as an aggressor state. Except for Armenia, all countries of the world recognize the territorial integrity of Azerbaijan including Nagorno-Karabakh as its integral part. And this indicates that the party to the conflict is not Nagorno-Karabakh, but Armenia," Asadov said. The Chairman of the Grand National Assembly (Parliament) of Turkey, Binali Yıldırım, also expressed his attitude towards this issue. "At this meeting, which promotes peace and stability on the planet, it is impossible to accept thoughts contrary to the truth. If Armenia really wants to establish ties with Turkey, it should renounce the claims of a false "Armenian genocide", leave the investigation of historical events to the historians themselves. The Chairman of the Azerbaijani Parliament Ogtay Asadov spoke in detail about the Armenian-Azerbaijani Nagorno-Karabakh problem. In essence, by taking such a position, Armenia has isolated itself. Armenia must understand that relations with its neighbors must be normalized and must take the path of peace, stability and well-being in the South Caucasus region. Only in this case, the existing problems can be solved," Yildirim said.